Inside Global Operations has 2 new interviews on their site. One with Executive Producer Mike Arkin, and the other with Associate Producer Chris Scaglione. Interview #1: Mike Arkin, Executive Producer of Crave Entertainment. "What really excited me most was that Barking Dog really had a good idea of some of the balancing issues involved in a project like this. Everything in the game is there for a reason and there are lots of things that are not there, also for a good reason. Some players are asking for game features that we do not want to add and I wish they could understand the depth of the impact that some of those features would have. BD gets it, so the game is very well rounded and balanced." "I'd have to say the most exciting thing for me about Global Operations, from the start of the project all the way up to the release (and even now, after) has been the Recon specialty and the teamwork that the game promotes. A lot of people say "It doesn't matter if you win or lose, it's how you play the game." Well, if you play as a team, you'll win every time. So you get the best of both worlds." Keep an eye out for the June issue of Australian magazine "Atomic" for a great review of Global Operations! Also check out the latest Global Operations dedicated website, Inside GlobalOps! -Remote server admin including kicking and banning. -In game voting for kicking and map rotation. -AFK kick as a server side option. -IP banning as a server side option. -Server side option to force balanced teams when you join. -Tac map shows enemies when they are outside. Read the Announcement on our message boards for the full list of fixes and new features. There's an update about the 2.0 patch over at Gaming Groove along with 6 screenshots that show the new filtering options, map voting, and IO improvement! Florida Gaming Network and Next Level Gaming have also posted new reviews of Global Operations. Revoemag posts an update on the 2.0 patch in our MESSAGE FORUMS and talks about the new features it'll have, some bugs it'll fix, and the plans for the demo! There's a little humor over at GameSpy with regards to the Intel Officer in Global Ops, head over there and check out The Daily Victim! The 1.2 patch is out! READ THIS THREAD in our message forums on where to download from and what's been fixed in this version! "There are several innovative features to this game that were unexpected and not yet found in any other FPS game I have played to date. First, footsteps have different tones for different surfaces, for example, gravel, concrete, and wood floors all sound different. Second is the effects of explosives, if a flash grenade goes off close to you, you get a white screen, temporarily blinding you, then the sound goes dead except for a buzzing simulating the ringing in your ears. This is exactly the effect an actual flash grenade would have, temporarily stunning your senses and making near impossible for you to detect approaching enemy troops. Very nice! Also, being hit with a Gas grenade without a gas mask has a nice blinking, blurry effect that is similar to the effects of an actual CS gas, again making it very hard to effectively continue the fight." 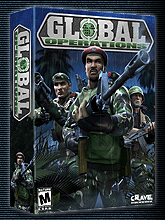 CompUSA has Global Operations on sale for $29.99! This offer ends April 13th, 2002 so HEAD OVER THERE and grab your copy if you haven't already! "Overall, Global Ops looks to be a strong contender for a CS replacement. Multiplayer games may not be easy to find in LAN shops, as the game requires a unique CD-key for every computer. This fact might hurt the popularity of Global Ops as LAN shops are easily the best places to pick up the game for those without a good computer. It is definitely worth sinking your teeth into. Go! Go! Global Ops!" Special thanks to Miss-Match for the catch!